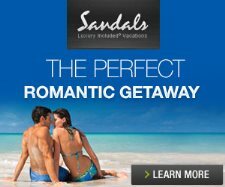 Sandals Negril premium accommodations are the Swim-up Crystal Lagoon Beachfront One Bedroom Butler Suites. (1R) have direct access into the Crystal Lagoon Pool from the patio. (P1) are 2nd floor units overlooking the Crystal Lagoon Pool from the balcony. (1R) Swim-up Crystal Lagoon Beachfront One Bedroom Butler Suite - Large 676 sq ft luxury suites with separate bedroom & living room. Fine mahogany furnishings, tiled floors, and 42" plasma TV in living room. King bed and 37" plasma TV in bedroom. Marble bathroom, double vanity, whirlpool bath, and separate walk-in shower. Ground floor patio with zero-entry into the Crystal Lagoon Pool. Beach and ocean views (these are the only swim-up rooms within the Sandals brand that also have beach and ocean views). Butler, concierge, and 24-hour room service. Located in the Sundowner River Building. 12 units #6102-6126. (P1) Honeymoon Penthouse Beachfront One Bedroom Crystal Lagoon Suite - Same exact suite and services as 1R except located on 2nd floor with balcony overlooking the Crystal Lagoon Pool, beach, and ocean. Also, ceilings are slightly higher. Guests use a shared staircase for Crystal Lagoon Pool access. 13 units #6202-6226. Sundowner Builing bottom floor are the One Bedroom Swim-Up Crystal Lagoon Suites with Private Lagoon Entrance. The upper floor are the Honeymoon Penthouse suites but they don't have private entrance to the pool. The One Bedroom Swim-up Crystal Lagoon Suites with Private Entrance are the top of the line accommodations at Sandals Negril. All Crystal Lagoon Suites include butler, concierge, room service, and in-room bar. Enjoy a private pool entrance as well as fantastic beach and ocean views. Each suite has a luxury living room section. The Honeymoon Penthouse One Bedroom Crystal Lagoon Suite is on the 2nd floor with a balcony overlooking the Crystal Lagoon Pool and ocean, but does not have private entrance into the Crystal Lagoon Pool.